I had a tough week. Thankfully I have blogging friends. I can go to blogs I enjoy and read that others are having the same issues as me, like here (see #4 and #5) and here. Even though I've only been blogging a short time I feel like I've made some friends and I've definitely been helped by more than one. Two fellow bloggers were rays of light in my otherwise dreary week and they both cheered me significantly! First, I received some really cool mail yesterday! A couple weeks ago I won a contest at Tracey's blog. She had a contest in honor of her blogiversary. She was giving away a print of one of her beautiful photos. Have you seen her photo blog?! It's one of my favorite blogs to visit everyday. She included a very nice note with it! Thank you so much Tracy. The colors in this print match perfectly in my house! I love it. The other blogger that brightened my week was Jenn. She has been a wealth of information to me. She honored me with this very heart warming award! Thank you so much Jenn! You have no idea how much this brightened my week. 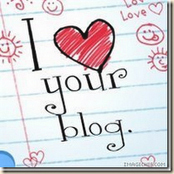 Now I will spread the love to some blogs that I especially *heart*!